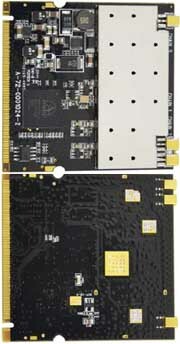 This High Power IEEE 802.11a/b/g/n 3T3R Wireless Mini PCI Card is built with industrial-grade components. It is designed for reliable and demanding outdoor, enterprise, and carrier-class applications. The Mini PCI interface integrates easily with embedded platforms to construct access points, wireless bridges, and consumer premises client equipment. MIMO technology provides higher throughput and farther coverage. *This high power IEEE 802.11a/b/g/n 3T3R wireless mini PCI card is built with industrial-grade components. *It is designed for reliable and demanding outdoor, enterprise, and carrier-class applications. *The mini PCI interface integrates easily with embedded platforms to construct single or multiple-radio access points, wireless bridges, and consumer premises client equipment. *MIMO technology provides higher throughput and farther coverage. *** Note: This high-power miniPCI radio card is designed for embedded and industrial OEM systems and should _NOT_ be used as a wireless card replacement for consumer laptops and notebooks. Please see our other 'standard' power radios for more options.